Hi! We’re Nikki and Amy. We hope to use this blog to tell you about all the books we are currently obsessing over, and which ones you shouldn’t touch! 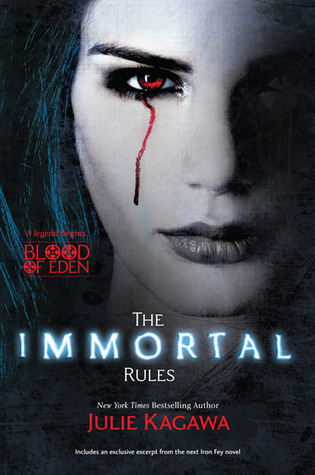 Review written by Amy: Our latest victim is this compelling novel: The Immortal Rules by Julie Kagawa. Allison Sekemoto is a Fringer, surviving on scraps. On any given night, she or any one of her crew could be eaten. Her only emotion is hate- for the bloodsuckers and their pets. But on the night she dies, she is given a choice- will she become a monster or be lost to the mortal world forever? Why We Love This Book, and Why You Will Too written by Nikki: I read this amazing novel first, and I immediately knew my cousin would fall in love with it as I had. I demanded she order it, and she did. The rest was history. Amy loves this book because: It is compelling and not like a fairy tale. If vampires existed, it would be realistic. She loves it because it makes her wonder if this might not really be a story, but a telling from the future. I agree with Amy; this book is also pretty much perfect. It has everything. It is everything I look for in a book. I think this author is an excellent fisherman, because she has us hooked! Spoiler Alert: Ladies, you will wish Zeke was your boyfriend! Rate: On a scale of one to ten, this is a solid twelve. This is a book that sticks with you for the rest of your days. It earns its place in the special part of your heart reserved for your favorite books. If you can, try and find the book cover in a better resolution so it’s not so blurry and sharp. Also try and make your book reviews just a little longer and maybe give the reader a little more background about the book, like for example tell them where it’s set and what kind of world this main character lives in. You guys have great potential and I hope you have a great blogging experience on this site! Everyone is so nice here! That reply was from my cousin, Amy. WE both always appreciate suggestions and tips. We are new to blogging, but we will try our best to tell you guys about new books we love. I’m glad you like our blog. Stay tuned for more reviews! P.S. I’m glad you liked the pun. Thank you for taking the time to comment. We’re both very happy that people are actually reading our posts! It makes me happy to hear that you think we have great potential! If everyone is as nice as you guys, then I think we’ll be in great shape!